Carey Rainey, office manager at 12th and Haskell Recycle Center, 1146 Haskell Ave., adds some more Christmas lights to a box full of decorations that will be recycled. 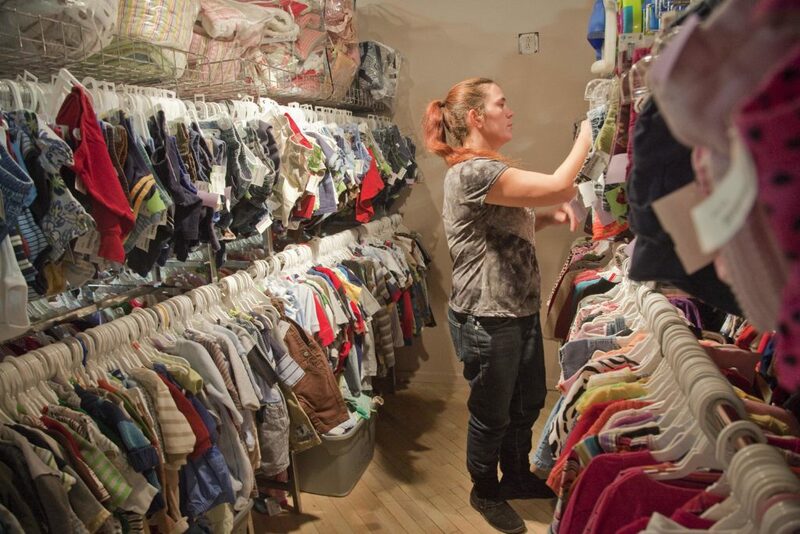 Volunteer Nadean Liska, Lawrence, sorts through clothes at Doodlebugs, 816 Massachusetts St., The store buys and sells gently used children's toys and clothing. For more organizing tips and strategies, see our “Go! Extra” board at Pinterest.com/LJWorld. Out with the old, in with the new. The adage goes for more than just a calendar change. It applies to your stuff, too. All those Christmas decorations that need to be put away, old toys abandoned for new ones, tired clothes taking up space after-Christmas sales could fill — now’s the time to get rid of the ones you don’t want, and get the rest organized. January is national organization month, and professional organizer Helen Stringer says post-holiday weeks are a great time to turn over a new leaf because you’re turning over inventory, so to speak, anyway. With these tips you won’t become one of those “overwhelmed” callers — and you might even make money on a few of your cast-offs. 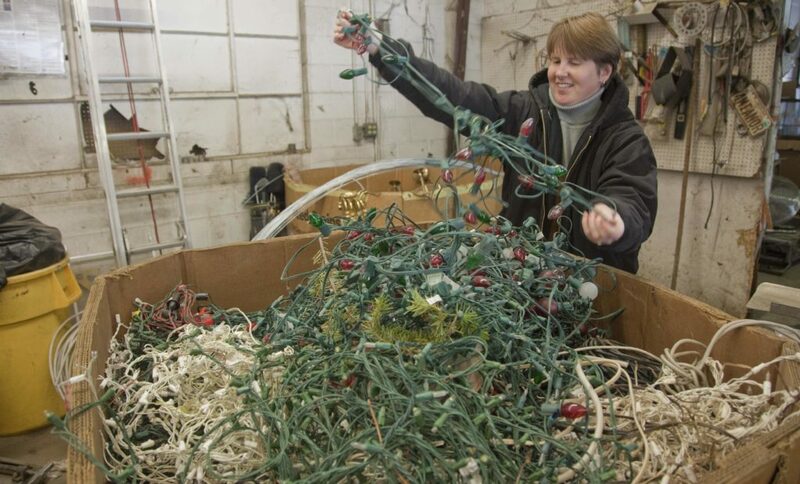 Keeping old Christmas lights out of the landfill is a worthy goal. Getting paid for them is a bonus. “We get tons of ’em,” said Bo Killough, owner of the 12th and Haskell Recycle Center, 1146 Haskell Ave.
For Christmas lights you’re keeping, resist temptation to throw them in a bag — you’ll be sorry next December. Wrapping them around a piece of cardboard is a cheap, easy way to spare yourself a big headache, Stringer said. The same goes for ribbons and beads. Organize other decorations in clear plastic bins, which enable you to see inside, Stringer said. Tape an index card to the outside of each bin and list every item in it, using a pencil so you can easily edit your list if the contents change. When you come across decorations that never made it out of their boxes this year, consider donating them so someone else can use them. As for live Christmas trees, the city of Lawrence will pick them up and use them for wildlife habitat. Have your tree — tinsel- and ornament-free — at the curb by 6 a.m. today or Jan. 7. Toys in good condition are candidates for resale, the business of shops such as Doodlebugs, a secondhand children’s store at 816 Massachusetts St. Owner Lawanna Huslig-Hanks said toy-buying slows down after Christmas but that she still tries to keep a variety of quality, gently used toys in stock. Huslig-Hanks said customers wishing to sell toys should leave batteries in electronics so she can verify they function, bring toys in containers with lids and plan on leaving them a while. It can take hours or days for her to inspect toys and look up recall information before offering a price. Goodwill, 2200 W. 31st St., welcomes donations of working toys, electronics and other items (everything but mattresses and baby furniture, for safety reasons) — as well as broken ones. If your children are young enough, you can go through their toys and get rid of those they’ve “aged out” of, Stringer said. For older children, suggesting they choose toys to let go of after receiving new ones is a great way to start teaching them about giving. When it’s time to organize the keepers, consider Stringer’s trick to keep toys from taking over the house: a toy library. The “library” is a toy chest in the basement. She keeps one attractive canvas tote for each of her two young boys upstairs in the living room. The boys are allowed to “check out” enough toys to fill their totes. When they want to bring up a new toy from the basement, they put one from upstairs back. Sorting through your closet and getting rid of old clothes is best done before you head out to buy new ones. Stringer’s rule of thumb is age-old. Jennifer Sievers, who owns Arizona Trading Co., 736 Massachusetts St., said she only bends that rule when she loves the way a piece looks — on her. She asks herself whether she bought the item because she liked it in general or thought someone else would like it, and if so, it goes. Like toys, there’s a market for resale clothing at stores like Arizona Trading Co. While each store’s taste differs, seasonality is usually key to making money from your cast-off clothes. Sievers said her buyers are focusing on winter-weight items now but that they’ll start taking warm weather clothing as early as Feb. 1. They look for accessories and basic pieces such as T-shirts, jeans and jackets — plus some pieces with interesting cuts or fabrics — that are in good condition with no obvious holes or stains. Just like toys, there’s always a home for damaged clothing at Goodwill. If it’s not sellable, Hoffman said, it can be turned into rags that are.